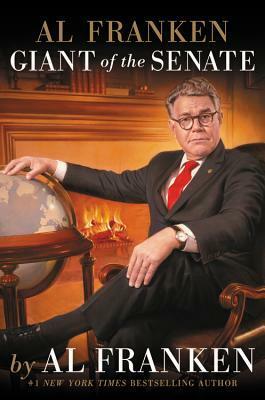 In this candid personal memoir, the honorable gentleman from Minnesota takes his army of loyal fans along with him from Saturday Night Live to the campaign trail, inside the halls of Congress, and behind the scenes of some of the most dramatic and/or hilarious moments of his new career in politics. Has Al Franken become a true Giant of the Senate? Franken asks readers to decide for themselves..
First off, the chapter on Ted Cruz is worth the price of this book alone. “I probably like Ted Cruz more than most of my other colleagues like Ted Cruz, and I hate Ted Cruz,” says Franken. But the entire book is full of interesting and enlightening details about his life and two careers. I really appreciate his honesty (he talks about how he cannot understand and abide by lying) and integrity as a senator. Franken sums up his memoir as “the story of how, after a lifetime of learning how to be funny, I learned how not to be funny.” Because senators aren’t supposed to be funny. But rest assured, Franken is still very funny, with his signature Minnesotan dry humor and droll observations found throughout. He recounts his childhood, his time on SNL, and his campaign run, as well as explains policy and political processes in a straight-forward manner that’s easy to follow and understand. I really enjoyed hearing about his friendship with Paul Wellstone, which inspired him to get into politics, as well as his reconciling his funny and serious selves. While there is a lot of ugliness in politics right now, and we are going through some terrifying times, Franken managed to make me feel hopeful by the end of Giant of the Senate. I think this memoir is a must read for people who truly want a fair, balanced view of politics and politicians. With a few jokes thrown in, naturally. 12/1/2017 ETA: God dammit, Al Franken. Listened to audiobook in July 2017. This entry was posted in books and tagged audiobook, celebrity, humor, memoir, midwest, non-fiction, politics, social commentary, society by kristin @ my little heart melodies. Bookmark the permalink.